IBS Dietary Advice to Calm Your Gut Book. Is ginger useful for treating IBS? The next ingredient to be reviewed is ginger. Ginger has many studies into its use to treat vomiting in pregnancy and to treat nausea during treatments such as chemotherapy or reducing sickness after surgery. Ginger has a long history of being used as a natural treatment for nausea, so one might expect that it could be used to reduce some of the symptoms of IBS. It is one of the most common herbal treatments used by patients to attempt to ameliorate symptoms of IBS (1). The action of ginger on the digestive tract is suggested to be an increase in prokinetic action of the tract (increasing movement or contractions without disrupting the rhythm) and it has also been suggested to be useful in pain reduction. The active ingredients in ginger can be seen in the diagram above and a placebo-controlled RCT parallel study in IBS (2) used the pharmaceutical grade ginger containing 2.29 mg/g of gingerols and 6-shogaols. Raw and cooked ginger contain different chemical compounds and may have different modes of action on the digestive tract. The study had a good choice of placebo (brown sugar) tolerated by most patients with IBS. Study numbers were small – a larger trial with at least 100 patients per group would give a chance of better results. Larger doses appeared to give poorer results from this study, but the numbers in each group were small. We are aware that IBS is a very heterogeneic condition (wide variation in symptoms between people) and studying those people reporting more upper GI symptoms of IBS such as nausea and reflux plus constipation might improve results if the mode of action is to increase stomach emptying and increase digestive tract motility. The study, unfortunately, did not show that ginger was effective compared with placebo so we have therefore no evidence that ginger is an effective treatment for IBS. Side effects in the study chosen were greater in the placebo group, the relevance for this is unknown – IBS is a challenging condition to treat with relapsing-remitting symptoms – no significance can be seen in regard to side effects as no statistics were applied to check whether this was significant in the study reviewed. Ginger is thought to be a safe treatment – ginger is also suitable to be used for the Low fodmap diet. So a great tasting low fodmap ingredient – but don’t expect it will stop your IBS symptoms. Just the ticket for a recipe then! 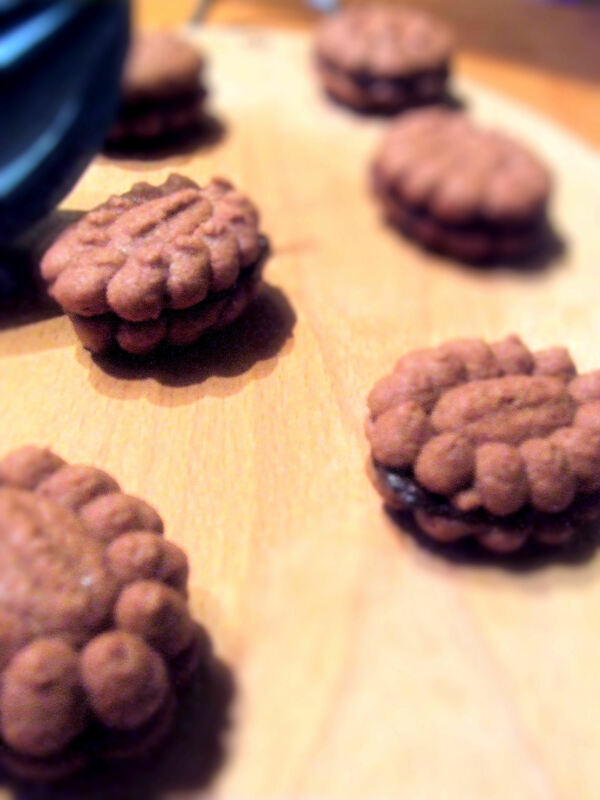 This is a very easy recipe to prepare and these biscuits can be stored in an airtight tin. They may go soft if not stored correctly. Add the dry ingredients to a bowl and ensure the xanthan gum is mixed into the flour. Add the wet ingredients to the dry and mix well till the mixture forms a dough. Roll out the pastry dough into a thin sheet on grease-proof paper or a Teflon sheet and cut out the biscuits. 1.Van Tilburg MA, Palsson OS, Levy RL, et al. (2008) Complementary and alternative medicine use and cost in functional bowel disorders: a six month prospective study in a large HMO. BMC Complement Altern Med. 2008; 8:46. Cream together the margarine and sugar. Sieve dry ingredients and add slowly to the biscuit batter, this should be slightly dry to allow shaping. For filling – melt chocolate and add mascarpone to it to make a stiff mix – stick biscuits together with cream filling. Chocolate & IBS - what's the deal? Gluten free raspberry buns and school cookery lesson reflections - seventies special! Garlic - the fodmaper's enemy? Saharan Harissa spice mix for Moroccan Chicken, Low FODMAP. Low fat tandoori chicken - made with Low FODMAP spice masala! Spinach, a superfood – fable, fact or just wartime propaganda?